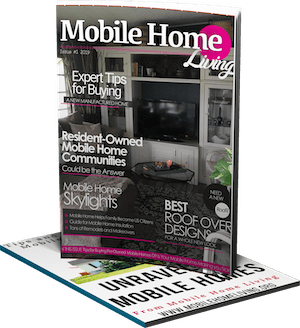 Mobile Home Syndrome: Is Your Mobile Home Making You Sick? Most of us started hearing about FEMA trailers shortly after Hurricane Katrina. FEMA had purchased 52,000 travel trailers to house the victims of the nation’s largest natural disaster but they ended up making thousands of their residents sick. The builders of these trailers used cheap composites with extremely high levels of formaldehyde off-gassing levels. Disaster survivors living in these toxic trailers suffered from off-gassing toxicity with symptoms including watery eyes, nosebleeds; coughing; wheezing; nausea; respiratory infections; and headaches. While it may have been the first time we’ve heard about formaldehyde off-gassing in recent years, it’s been a problem in modern construction since we started creating composite wood products. RV, mobile home, and, yes, even site-built homeowners have been complaining about formaldehyde off-gassing causing similar health issues decades before Katrina. All homes have synthetic or composite materials made from petrochemicals which means every home has off-gassing of toxic chemicals. 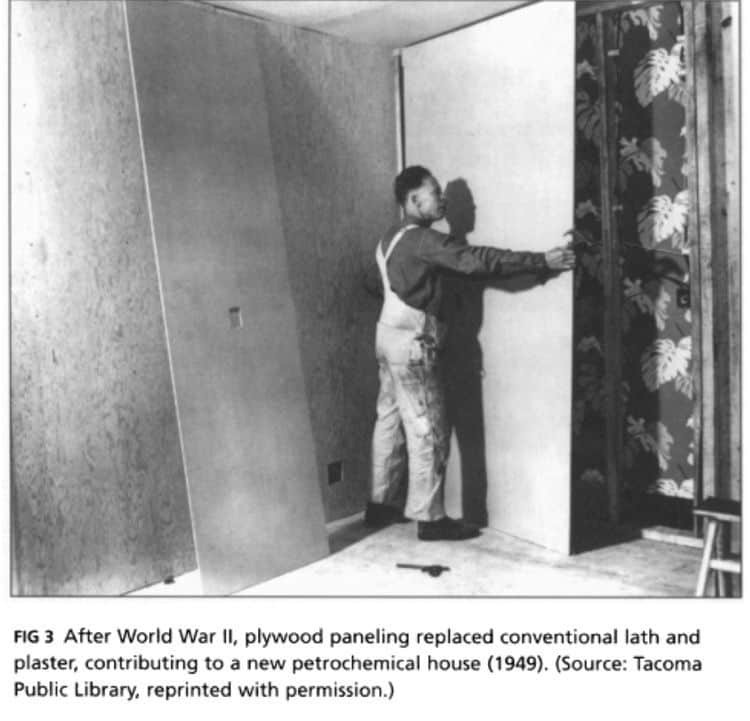 After WWII, plywood, a popular petrochemical product, started replacing lath and plaster walls. When it comes to our homes, we understandably want the absolute best for our loved ones, pets, and ourselves. We work hard to keep our homes clean, welcoming, and safe—which is why this whole concept of toxic trailers and the Mobile Home Syndrome is so fundamentally upsetting. Our homes are so supposed to keep us safe and warm, not make us sick. Our technological advances after WWII had many great benefits but there were plenty of problems and growing pains along the way. Mobile Home Syndrome was born from a construction movement towards cheap, synthetic materials that was only made possible by oil and the petrochemicals derived from oil. These derivatives gave us a vast array of products we still rely on heavily today. For instance, the phone or computer you are reading this article is made possible by petrochemical advancements. Our homes, offices, and schools wouldn’t be possible without the plywoods, lumbers, adhesives, etc. At the same time, these wonderful products created issues for health and quality of living from the 1960’s all the way to the present day. 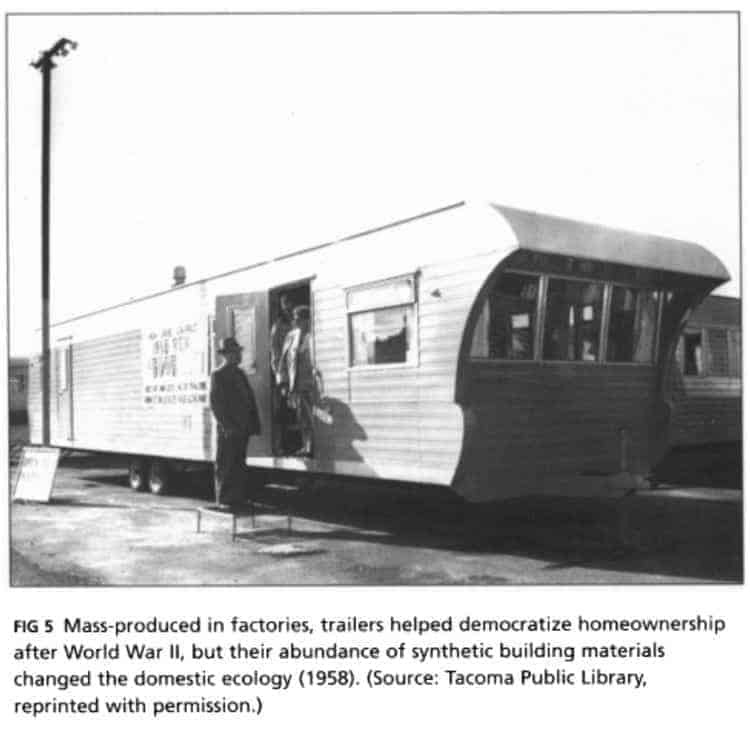 According to Janet Ore’s “Mobile Home Syndrome: Engineered Woods and the Making of a New Domestic Ecology in the Post—World War II Era,” many people were unknowingly exposed to toxic materials as a result of the cheaper, mass-produced homes that evolved from post-World War II economic conditions. After our troops came home from WWII, they were ready to settle down and start families but they couldn’t do that without a home. A nationwide housing shortage created a boom in mobile home sales that lasted for 25 years. Following the War, manufacturers prioritized the bottom line when it came to producing buildings, especially when it came to less expensive mobile homes. Materials needed to be cheaper and more lightweight and the best way to get that combination was to use petrochemicals. These gorgeous new mobile homes were perfect for a family just starting out – they were easy to buy, quick to set up, and extremely affordable. Mobile homes and trailers were mass-produced after WWII using abundant petrochemical derived synthetic materials. Advances in petroleum-based products, a deficit of housing, and a desire to create more (for less) all came together during this time —with unhealthy consequences. This stuff was new to the world and very few thought about their potential toxicity. 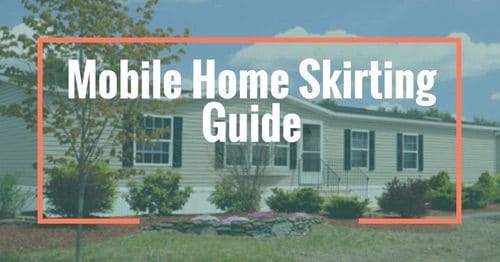 What’s the historical precedent of Mobile Home Syndrome? What sorts of materials contribute to poor indoor air quality? And what can we do to make our homes safer? A jarring 1984 report from the World Health Organization (WHO) announced that 30% of buildings worldwide “may be the subject of excessive complaints” in terms of Indoor Air Quality (IAQ). Issues of poor air quality were so drastic during this time that it was given a name: Sick Building Syndrome. 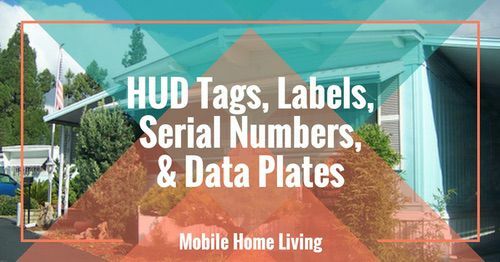 Though this term originally applied to all sorts of buildings, those of us who live in mobile homes might be specifically impacted. What do these synthetic building materials have in common? Unfortunately, many of these materials were bound together with or contained formaldehyde. Formaldehyde is also classified as a potentially carcinogen (meaning it may contribute to certain types of cancer). Unfortunately, as demand for synthetic building materials grew, so did the prevalence of formaldehyde-based adhesives. 1960’s. 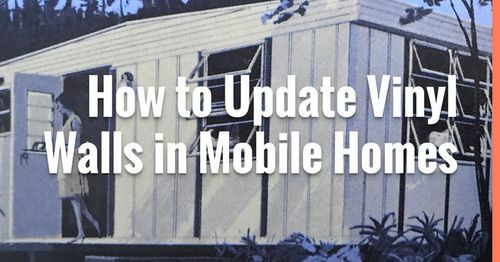 According to Ore, mobile homes were not classified as official “houses” prior to the 1970’s. This meant that builders didn’t have to adhere to the same codes and standards as other houses. 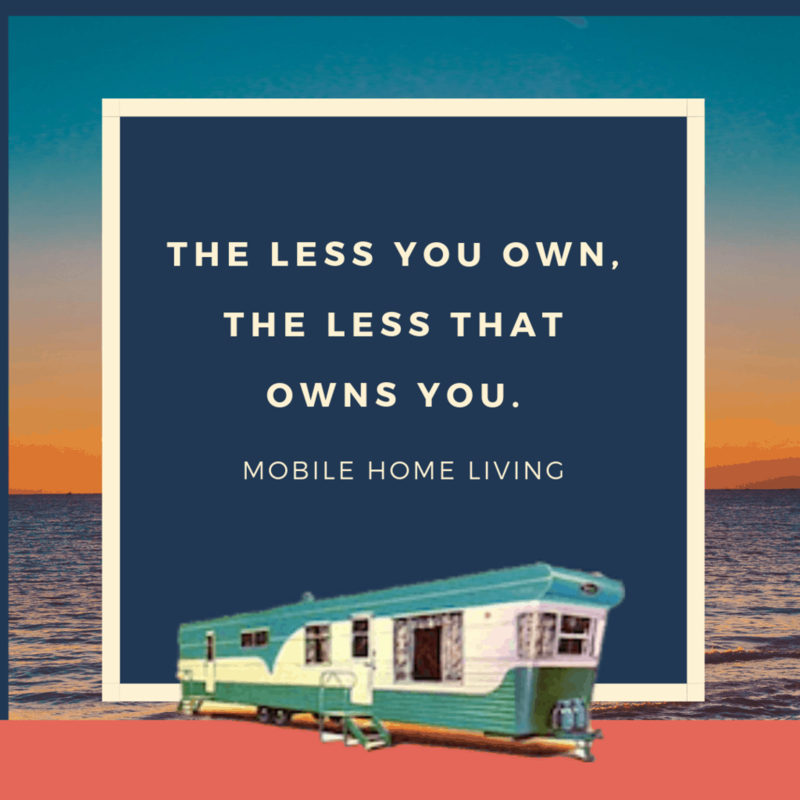 Because they were generally made to be more affordable, mobile homes were overwhelming made with cheap petrochemical products like plywood and particle board. Though studies were already being done to show that formaldehyde off-gassing could occur, it wasn’t enough to staunch builders. 1970’s. 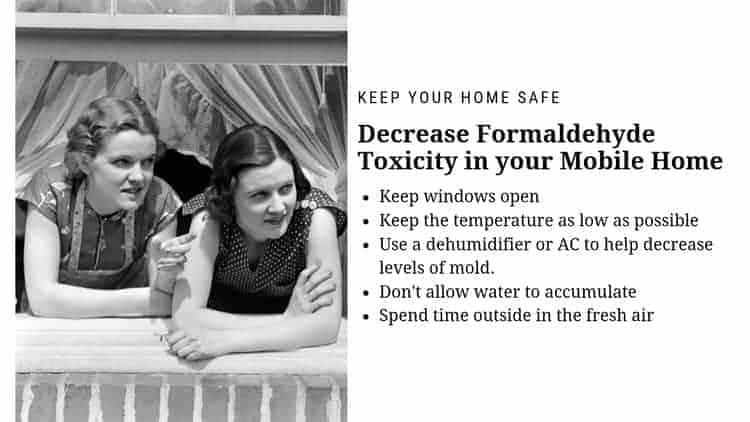 Formaldehyde wasn’t just used in adhesives: by the 1970’s, formaldehyde foam insulation (FFI) was heavily used as an insulation in mobile homes. 1979. By this point, some strides were taken in the name of public health, as individuals began to report the tell-tale signs of formaldehyde toxicity. Massachusetts, hearing consumer’s complaints about toxicity in the home, banned FFI at this time. 1980-1982. Escalating studies, complaints, and lawsuits lead to a temporary nation-wide ban on FFI used in homes. 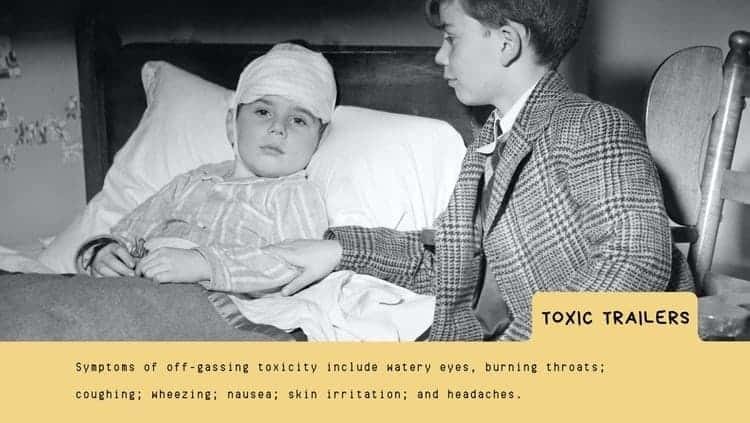 By this time, it was shown that petrochemical materials were indeed toxic to humans, a fact which was already evident for those who were suffering the effects of headaches, burning eyes, and chronic coughs. Researchers confirmed that formaldehyde eventually becomes unbound to the materials it’s built into, its gases leaking from adhesives and proving toxic for humans. Unfortunately, though the building industry reformulated its glues and processes in 1981, this didn’t solve the issue of the formaldehyde-containing particle board and plywood that had been heavily used in mobile home construction. Though the EPA, HUD, and other agencies eventually came together to decrease harmful emissions, this was unfortunately not the end of the harmful petrochemical legacy in mobile homes. Hurricane Katrina left thousands of families homeless in its wake. To temporarily house the homeless, FEMA (Federal Emergency Management Agency) provided travel trailers and single wide manufactured homes to displaced individuals. Because of the immediate need (and cost) these trailers were made quickly and with inexpensive materials. Though they were only meant to house people temporarily, some individuals and families remained in these FEMA trailers for years. But the problems didn’t take years to develop: in fact, many occupants immediately noticed a strong and chemical odor. Some began to get nosebleeds, headaches, and even have trouble breathing. By 2008, the CDC found toxic levels of formaldehyde in these trailers. That same year, it became clear that the companies who produced these FEMA trailers were aware of the high formaldehyde levels—and provided them to homeless people anyway. ToxicTrailers.com is a great source about FEMA’S toxic trailers should you want to learn more. Department of Health and Human Services classified formaldehyde as “a known carcinogen,” in 2011. Formaldehyde-leaking materials can cause some serious health issues. A constant sinus and/or respiratory infection is probably the most obvious. If you seem to be sick all the time, it could be caused by formaldehyde toxicity. While travel trailers and mobile homes are well-known to have excessive off-gassing levels, a site-built home can be toxic as well. Mass built communities that pop up seemingly overnight is likely to have high levels of formaldehyde toxicity. If you feel like you have symptoms of formaldehyde toxicity then you may want to have your space tested for toxicity. 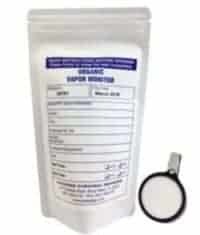 ACSBadge has a complete formaldehyde testing kit for $60 here. It’s the same test that FEMA and the Sierra Club uses. Certified Kit has a DIY indoor quality testing kit for $150.00 that tests for over 7000 different chemicals here. Of course, Amazon also has a DIY indoor quality testing kit for $109 here. 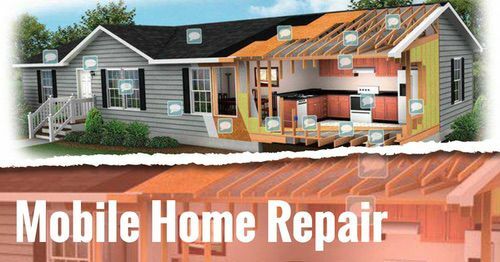 You can also reach out to local home inspection agencies in your area and get a quote from them. Thankfully, factory-built homes are better regulated to guard against dangerous levels of formaldehyde. According to the CBC, having a formaldehyde level of 50-80 ppb is high, while 10-50 ppb is considered medium. Although they assert that formaldehyde concentrations within these levels probably won’t cause acute health problems, they suggest that it’s still worthwhile to take preventative measures. Keep windows open, if possible, to allow plenty of fresh air into your home. Keep the temperature as low as possible (within comfort) to prevent your indoor air from overheating too much. If you have a dehumidifier or an AC, run these to help decrease levels of mold in your home that can also contribute to safety issues. Don’t allow water to accumulate, and clean up mold immediately. Spend as much time outside in the fresh air as possible. These guidelines from the CDC are common-sense advice to decrease toxicity through ventilation and mold-control. But if you ever feel like you’re becoming very ill or in physical danger, they recommend that you see a physician immediately. Mobile home syndrome and the FEMA toxic trailers were a direct result of our advancement and use of composite and synthetic materials made by petrochemicals. The glues and resins used to create plywoods and panelings have many chemicals, formaldehyde being the most dangerous. FEMA’s toxic trailers may not have been avoided. These disaster relief units were built in a few short months using the cheapest materials possible because of budget issues and profit margins (just like the trailer orders in WWII). The hurricane survivors were moved into the trailers quickly after they were built and lived in them full time for months, even years, at a time. These trailers were never meant for full-time living so of course there would be issues. Off-gassing levels reduce over time and can be lowered quickly with better airflow and ventilation. Newer homes are built more airtight so formaldehyde off-gassing may affect more people. If you have any symptoms create more air flow and consider getting a test done in your home so you can know exactly what you’re up against. Have your experienced formaldehyde toxicity? 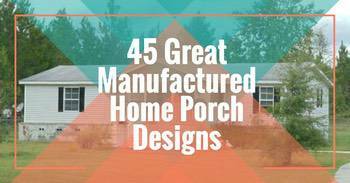 Has your mobile home made you sick? Does your home have a leak that would allow black mold to grow? That’s usually the main culprit of these kinds of cases. You need to do an extensive inspection of the home and find out where the leak is and get it fixed and all the mold removed. I’ve read that mold can create havoc psychologically and make the body susceptible to all kinds of issues. Go under the home and look for any kind of moisture or dampness. Especially around the tubs, sinks, toilets, and laundry. Then go on the roof an look for any kind of weakness in the metal or shingle damages or any pooling water. I love your website but this article isnt quite accurate. For Evey person that was sick cause of their mobile. There is probably 10 people still living cause of theirs. Very timely article. I wonder what happened to all those fifty thousand plus trailers? Still out there? Recycled? Buyer beware. I wonder if today’s RVs are scrutinized for such chemicals? Hi Victor! Those trailers were eventually sold through public auction.